On the slopes of the Guarene hill, the main crops consist of vineyards and fruit trees, especially the numerous hazelnut trees present throughout the territory, which produce a good amount of hazelnuts for the food industry. 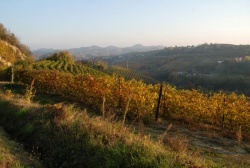 The sunny vineyards produce fine wines such as the refined and fragrant Roero Arneis, the noble Nebbiolo, the Dolcetto, and the robust Barbera, while many varieties of fruit are also grown, among which the Madernassa pear stands out. On the plain of the Frazione Vaccheria horticulture, is predominant, in particular as regards tomatoes, peppers, garlic, and the delicious thistle, the fundamental ingredient of the traditional “Bagna Caoda”. In addition to the traditional Hazelnut pie, to be paired with moscato-flavoured eggnog, and the various sweets made with hazelnuts, many local specialty desserts are made with fruit. Worth mentioning are the peaches soaked in Arneìs wine or in the sparkling Birbèt, the fruit pies and the delicious Madernassa pear cakes. This variety of pear, cooked in wine and served cold, is also an excellent dessert on its own. The Madernassa pear has been grown in Alba and in the Val Grana, Cuneo area, since the last century. It originated on the acreage surrounding the Cascina Gavello in the Borgata Madernassa then in the City of Guarene, located about halfway up an east-facing hill, between the villages of Guarene and Castagnito. The mother plant dates back to 1784 and, at first, this variety was known as “Gavello”, but it was later referred to as “Madernassa”. It has been widespread especially for the last 30 years following the continuous demand from foreign markets, above all the British one. The area where it is most intensely cultivated is the left of the Tanaro, on the hills of the cities of Canale, Castagnito, and Guarene, where the production is about 5000 quintals in 70 days and involves over 30 producers. In the Cuneo area, it is often found in mixed cultivation associated with vineyards, as well as in specialized areas of discrete amplitude. It is widespread also outside the province and pear trees of this variety are also found in the Canavese area and in Emilia. This fruit is characterized by remarkable rusticity and good fertility. It is particularly suitable to be cooked, due to its characteristic flavour and high sugar richness. The shape of the fruit is piriform, slightly flattened at the end, and medium size. The colour of the peel is greenish with sometimes reddish or brownish grey shades, depending on the soil; the pulp is compact. Harvesting normally begins at the beginning of October and lasts till the end of the month. It lends itself very well to being stored and transported. Even today, as in the past, many housewives bake their pans of madernassa in their “putagè” (wood-fired ovens). The procedures for obtaining a D.O.P. (Protected Designation of Origin) certification have been started; this recognition would be synonymous with the ancient tradition and the great identity of this product and its area of origin.